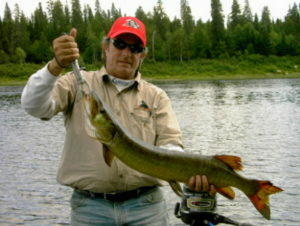 The most popular species are brook trout, lake trout, landlocked salmon and muskie. To find out about our annual $35,000 purse muskie derby click here. For a summary of fishing rules and regulations click here Fishing Laws Be forewarned that these regulations were probably written by an aspiring lawyer, but it’s worth the time to read the rules and stay legal. This is not a sport for the faint of heart. The wide open expanses on the big lakes can get rather drafty. However, some mighty nice fish are pulled through eight inch holes in the ice. While putting this page together we discovered that there is no closed season on coyotes. Also, there are open seasons on crows, skunks and porcupines. Who knew? What a tasty stew that would make!